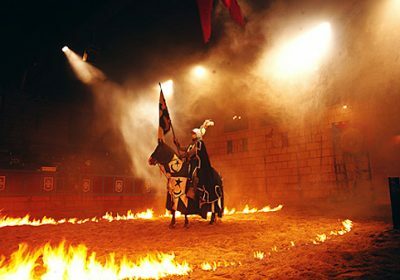 If you’re planning a trip to Tenerife and looking for attractions then something to consider is the Medieval Evening. I went on this trip a few years back with my family. Now let me start by saying it’s not cheap, in fact had we not been on holiday with another family who talked us into it, we may never have gone on this trip at all given the price. But I am so glad we did, I’ve recommended to anyone I come across going to Tenerife since and would definitely budget this into my holiday next time we visit Tenerife. Attractiontix is a great site for getting your attraction tickets before you travel and taking care of one more thing on your holiday check list. So here’s how it works… you meet your transport on the day of your trip at a chosen pick up point (we were just a little walk from our hotel, a couple of minutes away). We were staying in Playa de los Americas on this holiday so it was quite a drive to San Miguel’s Medieval castle but the coach was comfortable. Upon arrival at the hotel we were allocated our Knight – given a bib representing his colour and lead into the castle. It was sooo excited, the kids were busting at the seems. Instantly we were plied with drink, wine and bottles of soft drinks which just kept flowing… I’m not going to lie to you, I was more than tipsy and this certainly contributed to the atmosphere as the Knights started their jousting. Everyone really gets into the spirit with the Knights egging you on. It’s just so much fun. We had a meal placed in front of us and we really enjoyed this, chicken, chips, simple for everyone to enjoy but tasty. 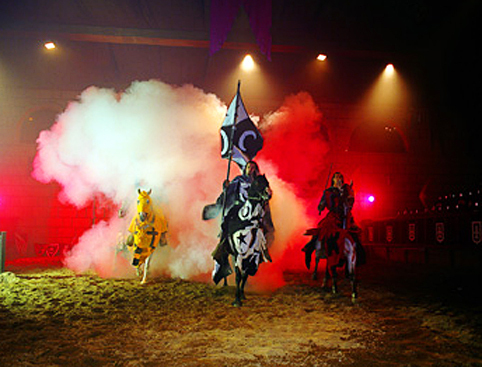 Leave the sun, sea and sand behind, grab your family and friends by the hand and step into a world of jousting, feasting and cheering on your team’s Knight at the super-popular family-friendly Medieval Night Tenerife! Take a trip out of the ordinary whilst on holiday in Tenerife, with a trip back in time to an age when knights battled for the hand of a fair maiden. This family-friendly evening begins with pick-up from the south of the island, from where you’ll be taken to a Medieval Castle in San Miguel. Once you’ve donned your team’s coloured apron and been introduced to the King and Queen, you’ll head to the main hall. Once seated, you’ll be served by wenches and serving boys with a hearty feast of three courses, unlimited wine, water and soft drinks – a feast fit for the King himself! And before you the show unfolds, with your team Knight battling for your part of the audience only. Show your appreciation of his jousting skills with lots of cheering and noise – no need to be shy on Medieval Night in Tenerife! And once the feast is over and the hand of the fair maiden has been won, you can dance the night away as the incredible Drifters perform their greatest hits!